The 2015 USHA National One-Wall Championships: Tyree and Danielle Slam! The crown jewel of 1-Wall small ball handball produced dramatic matches, a new champion, the return of a veteran superstar and two slams. Players battled temperatures in the high 80’s with stifling humidity throughout the five-day event, with the winners demonstrating the most skill and stamina in the grueling on-court conditions. The Men’s pro singles featured top seed and two-time defending champion Tyree Bastidas gunning for his third consecutive and fourth overall title singles at the USHA’s mid-summer classic, while a number of former champions and rising stars aimed to derail the Bastidas express. Bastidas cruised to the final without dropping a game, handing WPH R48 #9 pro Stephen Cooney, European 1-Wall superstar Vlad Klym and WPH R48 Player’s Championship quarter-finalist Mike Schneider two-game defeats. Seventh-seeded and soon to be 38-year old two-time 1-Wall national singles champion Cesar Sala entered the 2015 USHA National One-Wall Championships with little fanfare and absent on many of the experts short list of contenders. Sala advanced to the quarterfinals with a two-game victory of Stephen Woo and survived a close first game quarterfinal against the 2015 Speaker’s Cup champion William Polanco to advance to the semifinal, 21-20, 21-10. Sala would need to defeat a white-hot Billy O’Donnell in the semifinal to make his first final since 2009. Sala started slowly against “The Bus,” dropping game one 21-8, but roared back in game two to force a tiebreaker and won by the most narrow and sensational of margins, 11-10. Cesar Sala started quickly in the final, racing to a 14-0 lead by hitting spectacular serves and ending rallies with first-strike kills. Bastidas surged back, cutting the deficit to 13-15 with sensational drives with both hands. Two points would be as close as Bastidas would come, as Sala took a one-game lead, 21-14. Bastidas continued the momentum he started in his game one comeback, building an insurmountable lead and evening the match, 21-11. The tiebreaker would prove to be a classic, as both champions hit the pavement on multiple occasions while staging incredible rallies and shot making. “Tyree built an early 4-2 lead but neither player was ever able to separate themselves,” stated WPH reporter James Flaherty. “The rallies were incredibly grueling and the play was outrageously good.” Tyree scored his points in the third frame with hard low serves and “out the door” drives, while Sala relied on a nearly flat kill shot that not even Bastidas could dig. “With the score tied at nine, Tyree hit a diving rekill off of a seemingly perfect Sala left-handed kill to make the score 10-9,” stated Flaherty. 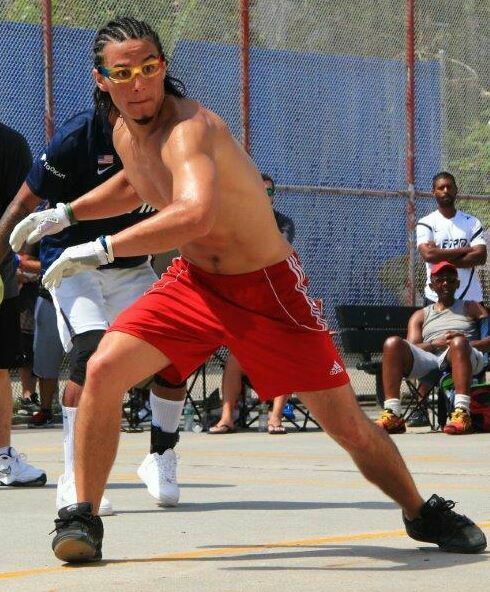 “On match point, Tyree rushed the front court, hit a hard shot to the left that pushed Cesar off the court and forced him into an impossible position to make a return.” Bastidas proved that he owns Coney Island, winning his third consecutive 1-Wall Nationals and fourth overall. Bastidas completed a perfect weekend, claiming the doubles with Billy O’Donnell over Victor Lopierre and Timbo Gonzalez to complete the “Bastidas Slam,” 21-9, 21-18. Danielle Daskalakis entered the women’s 1-Wall singles final determined to win her first pro singles title at Coney Island’s 1-Wall national championships. Standing in her way would be the hottest player in 1-Wall handball, Sandy Ng. 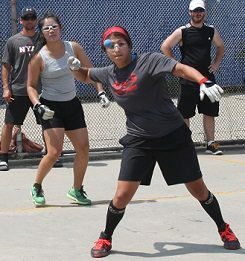 Ng captured the USHA Women’s 1-Wall Big Ball Singles title and the Speaker’s Cup Women’s Small Ball title earlier this summer and was seeking the triple crown at Coney Island. Just as Bastidas had done earlier, Daskalakis completed the slam by teaming with Sandy Ng to defeat Dori Ten and Barbara Canton-Jackson, 21-4, 21-2.